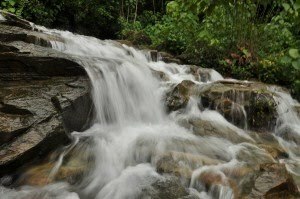 For people staying in and around Manipal this falls is worth visiting. Situated at a place called ARBI which is near by Dasharath Nagar, Manipal! Thanks to my mom who came to know about this via some local channel and on Sunday @mildwave, @nits4ever, @akshy8 and myself visited this place. Amidst nature this place is really worth a visit. No risk whatsoever of getting drowned in water here. One has to just watch his footing while wading through the water as the rocks are pretty slippery. Usually when the word ‘water falls’ hits our mind the picture we get is water falling from a great height on to the rocks. But here it isn’t that way. A very small Falls you can say but the way the water flows its really mesmerizing. Small picnics can surely be arranged here and as of now the place is almost empty just because people never know about this place. Route to reach ARBI FALLS : Manipal -> Dasharath Nagar(take the first left after down town while coming from manipal) -> Vaishnavi Durga Devi Temple -> Next to the temple is the falls.